In the thirty or so years before the First World War, postcards—and in particular, Shakespeare-related postcards—were virtually everywhere in England and on the American Atlantic coast. These are important historical materials in that they convey the atmosphere of photography in the period and are artifacts of communicable exchange, postal distribution, and turn-of-the-century stage performance. In an age where instantaneous communication is commonplace, it is revealing and refreshing to get a glimpse at how people exchanged information through more artistic means. These postcards should be of interest to scholars of history, theater, visual art, and literature alike. Some of the more famous publishers of these cards were also major publishers of postcards as a whole. 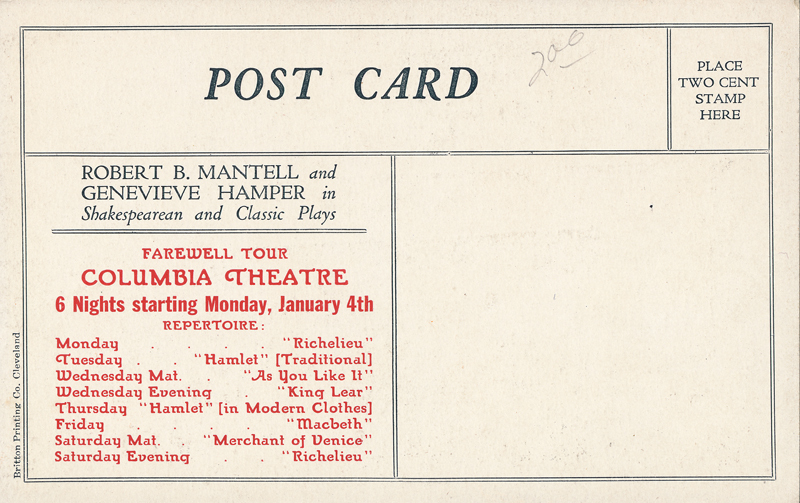 Featured in our collection, some of the giants of the postcard industry include Percy Guttenberg, Rotary, Raphael Tuck, C. W. Faulkner, and J. Beagles & Co. Guttenberg had a monopoly on the postcard publishing industry for performances in Manchester—second only to London in the volume of Shakespeare stagings in England. His “Revival Series” for the Queen’s Theatre in Manchester is well-represented here. The Rotary Photographic Company Ltd. was active in London between 1897 and 1916 and published an astonishing volume of postcards including some famous images of Ellen Terry and Henry Irving in The Merchant of Venice. Marlis Schweitzer, in her book Transatlantic Broadway: The Infrastructural Politics of Global Performance (2015), discusses the power of postcards to serve as tools for imperialist enterprises at the turn of the century. the fact that so many of these cards featured Shakespeare raises many questions. HOW POPULAR WERE THESE CARDS? The postcards were sold in a variety of places—often alongside other popular cards featuring landscape scenes and cityscapes. Many were sold at gift shops and stores. In 1911, one post office reported selling over seventeen million postage stamps destined to be stuck to millions of postcards. In his article, “Shakespeare for a Penny,” Rusche suggests that even if a fraction of the nearly 735 million cards sold in England in 1906 featured Shakespeare, that would still an enormous amount of Shakespeare proliferating the country at the time (22). The messages on the backs of many of the cards suggest that many of these cards were sold at the theaters themselves during performances. They functioned, in this way, as mini-advertisements for the shows. If you notice, some of the cards in our collection feature performance schedules on the backs so that playgoers would know when their favorite plays would be showing and actors playing in them. Some people would even take these cards to the shows to get autographs from their favorite matinee idols such as Lewis Waller, who we might compare to a Leonardo DiCaprio in today’s world. Many people, Rusche observes, traded postcards with one another—for either sending or collecting—which is how he says that he came into possession of much of his collection. The time span of our collection stops in the year 1914. World War I signaled a major shift for the postcard industry, especially the so-called “golden age” of postcards, for various reasons. First, consumer needs changed as war was waged. Second, Germany was one of the major producers of the chrome lithography used in the beautiful glossy images and was the location of some of the major holding companies for such publishers as Rotary (Neue Photographische Gesellschaft). However, once Britain declared war, these associations were severed in the name of patriotism. After this severance, materials used in the production of postcards changed considerably as national funds went toward the war effort. Although the production of stage plays in England generally declined in 1914, Anslem Heinrich notes in his essay, “Reclaiming Shakespeare: 1914-1918,” that some of the major names, like Terry, Forbes-Robertson, Tree, and Benson, continued to perform Shakespeare, especially some of the more nationalistic plays from the History canon on stage and on the radio. Benson reputedly staged a rousing performance of Henry V at the conclusion of his popular Stratford Summer Festival on the same day that Britain declared war on Germany. Heinrich gives evidence of an array of Shakespeare which continued to be produced, in various ways, during the war. Histories and Tragedies were configured on stage in England and on the battlefront, often in snippets, to convey nationalistic pride. Comedies were staged and broadcast across the channels to raise the national spirit. The “national hero” Shakespeare, nonetheless, was often—and still is—appropriated for patriotic purposes. For more information and an in-depth analysis of the impact of the postcards during this period, please read Harry Rusche’s Preface to Shakespeare & the Players. The three postcards images to the right show (1) Charles Doran as Brutus in Julius Caesar, (2) Annie Russell as Puck in A Midsummer Night’s Dream, and (3) Halliwell Hobbes and Matheson Lang as Tybalt and Romeo in Romeo and Juliet.